Is TPO Viable as a Miami Roofing Material? 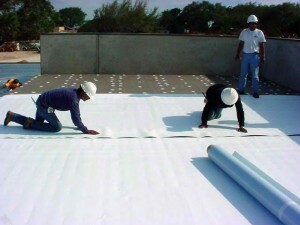 Thermoplastic Olefin (TPO) is a single-ply roofing membrane that first appeared in the market in early 1990s and became one of the fastest-growing commercial roofing materials in the construction industry. It was marketed as possessing the qualities of Ethylene Propylene Diene Terpolymer (EPDM) and polyvinyl chloride (PVC) without their disadvantages and costs. The product is supposed to have the same heat and UV resistance as EPDM and at the same time heat-weldable similar to PVC. With these qualities, TPO is hyped as a cheaper and more efficient alternative than PVC roofing products. Is it safe then to state that TPO is a viable Miami roofing material for use in today’s buildings? Let us examine closely the benefits and disadvantages of TPO roofing. TPO can be manufactured to fit and look great on different home designs and styles. Homeowners can choose between various colors, including white, light grey and black. Modern technologies make all colored TPO roofs resistant to Ultraviolet rays. TPO roofing costs less than PVC roofing. The cheaper cost of TPO material makes it an attractive alternative to PVC products while offering the same benefits of PVC, including heat-weldable seams and energy efficiency. TPO roofing can better withstand a building’s contraction and expansion from fluctuations in temperature compared to other single-ply membranes. It is also durable and can resist impact, fractures, dirt and mold. The material is flexible enough to withstand the building’s natural movements. The strongest argument against TPO roofing is its track record, or lack of it. The technology has been around for only about ten years and has not proven itself to be durable in the long term unlike other roofing materials that have been in existence for decades. Manufacturers of TPO are still looking for the perfect balance between an economical price and product durability. The roofing industry has seen letdowns of TPO in the past such as failures at the seams and membrane cracking and curing. TPO roofing is noted to be weak when constantly exposed to high temperatures. The material experiences accelerated weathering and deterioration from high thermal loading. Most problems were noted in Southern states and cities where the sun shines most of the year. Asking the manufacturers about the suitability of their products to withstand at least 160 degrees of heat is recommended for safety purposes. Otherwise, a different roofing material is advisable to avoid untimely deterioration of the roof. So if you live in Miami with its hot and humid summers, TPO roofing may not be the best material for your roof.